10 am. to 3 pm. Tuesday through Sunday late June through August. TBA, occasional pre- and post-season shows in May, early June and September. For dates and times of receptions, see the 358 Exchange or Coming Events in the classifieds section of the Valley Voice. 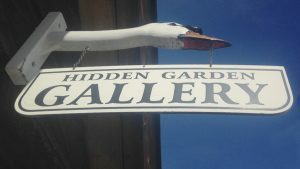 The gallery and garden are wheelchair-accessible. Bar fridge, dishes, kettles, counter, 24 chairs, bench, 3 card tables, 1 small table, half a dozen plinths of various sizes, installed hanging system and some hanging supplies.